Coun. Melissa De Genova is presenting a motion at Tuesday's council meeting that suggests how the City of Vancouver could more strongly punish fighting in the Granville Entertainment District. A Vancouver councillor says it's time for people who get into fights on Granville Street to start paying the city back for the violence they bring to the city. Non-Partisan Association Coun. Melissa De Genova is presenting a motion at Tuesday's council meeting that suggests ways the City of Vancouver could more strongly punish people caught fighting. "I think that it's important that we send the message that it's not OK to come into Vancouver to cause harm to others and that there will be consequences," said De Genova. She said 2016 data from the Vancouver Police Department shows that 64 per cent of individuals booked by police on Friday and Saturday nights were not residents of Vancouver. 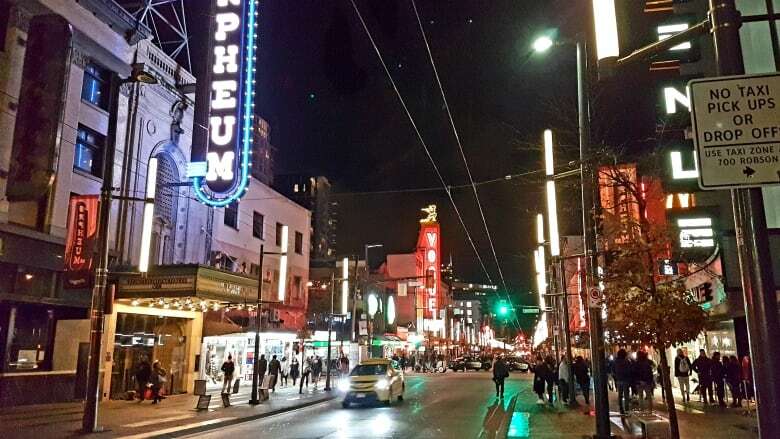 The motion says an overwhelming majority of fighting fines are issued in Vancouver's entertainment district, particularly on Granville Street, using up VPD and City of Vancouver resources. It adds that it's general knowledge among those who are fined that the consequences they face are minimal. De Genova wants city staff to study the possibility of holding back renewals of B.C. driver's licences and other identifications for people who haven't paid their fines. "With speeding tickets, it's points on your licence and a fee before you can renew your driver's licence," said De Genova. "I can't see why we wouldn't be doing this for people who are openly assaulting others that are just trying to walk down our streets in the city of Vancouver." Curtis Robinson, chair of Vancouver's Bar Watch program, thinks increasing the fines would make potential brawlers think twice before starting trouble. "It would actually be a very big reminder that there are consequences to your actions if you're that type of character that comes down to Vancouver with the expressed intent of looking for trouble or getting into a fight." Currently, violating the street and traffic bylaw for fighting carries a fine of $500. De Genova says if the motion is passed by council, city staff would be directed to consult with the VPD and the B.C. government on ways to increase the fines and increase penalties for those who don't pay them.